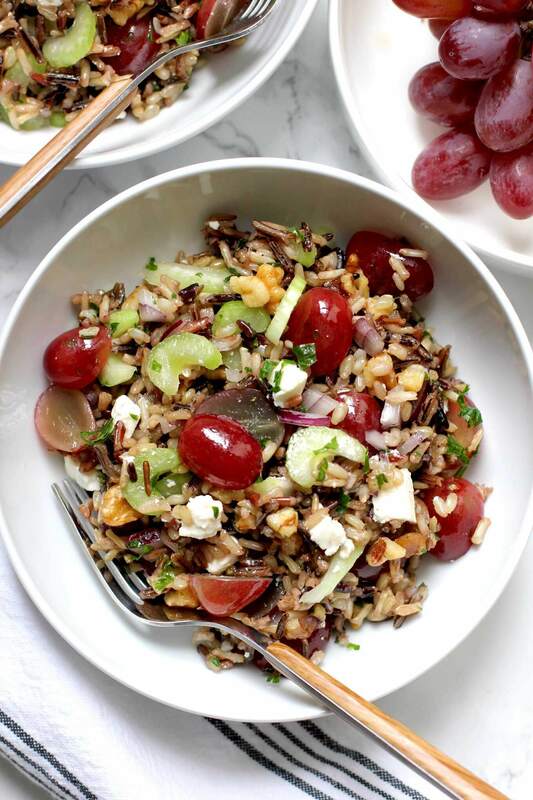 This wild rice salad with grapes features nutty, chewy wild rice tossed with sweet grapes, feta cheese, crisp celery and walnuts. It’s sweet and savory – a warm, filling salad perfect for chilly fall nights. It’s officially fall and I’m seeing lots of grapes at the market, so I’d thought I’d share this wild rice salad with grapes. This recipe is very easy to put together. 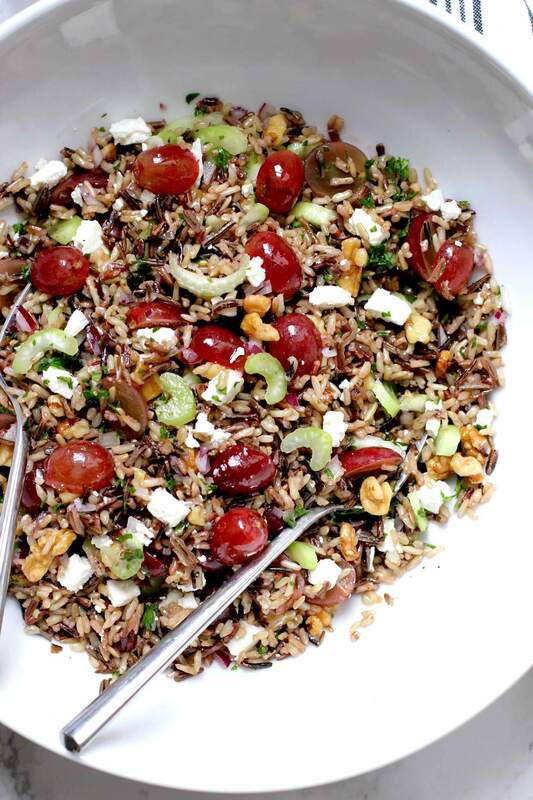 Cooked wild rice is tossed with sweet red grapes, crisp green celery, salty feta and crunchy walnuts. To finish it off, I toss it with a simple red wine vinaigrette. It is full of flavor and texture. It’s chewy and nutty with a sweet and savory kick from the grapes and feta cheese. I used wild rice from Lundberg Farms – the package was called Wild Rice Blend – that I found in the supermarket. It’s a blend of wild and brown rice. I recommend getting a blend of wild and brown rice rather than just plain wild rice. Early fall is peak grape season. They are sweet, ripe and bursting with flavor. Here’s a tip when buying grapes, look for a green stem. If the stem is green, the grapes are fresher and sweeter. A brown stem means older grapes. The wild rice does take a while to cook – about 45 minutes – but it will fill your house with a lovely nutty smell. While the rice is cooking, prep all the rest of your ingredients. Then, once the rice has cooled slightly, toss everything together and you’re done. This warm wild rice salad with grapes is the perfect healthy side to serve on a crisp fall night. You want to make sure to buy seedless grapes. Use a wild rice blend that has both wild rice and brown rice. Let the wild rice cool slightly – about 10 minutes or so – before adding it to the rest of the ingredients. This salad works best warm – when it’s soft and chewy. If you have leftovers, you will need to add additional dressing since the cold rice will have absorbed the dressing. Also, the rice will be firmer in texture when it’s cold. If you make this recipe and enjoy it, please come back and leave a message and rating for the recipe! Thank you! Cook wild rice as per the package instructions. I added one bouillon cube to the water before bringing the rice to a boil to give it more flavor. 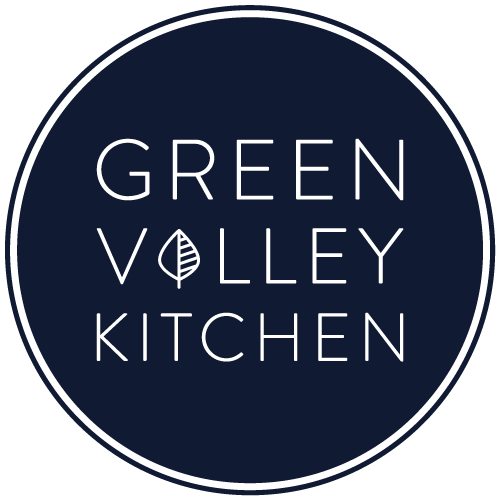 While the rice is cooking, chop grapes in half, slice celery stalk thinly, dice feta and add to a bowl. Next, mince both the parsley and red onion and add to the bowl. Add walnut pieces to the bowl. When rice is done cooking, take off of the heat and set aside with the lid still on the pot. Let sit for 10 minutes or so until it cools slightly. Fluff rice with a fork and add it to the bowl with the other ingredients. Toss with dressing and serve. Let the rice cool, with the lid on, for 10 minutes before adding to the salad ingredients. This salad is best served warm. If you eat any leftovers the next day you will need to add additional dressing. The rice will have a firmer texture when it’s cold. Thanks, Kyle – hope you enjoy it! It holds up well – so will be great to bring pre-made on a road trip! This looks absolutely delightful! I love the sweetness punctuating the earthy wild rice. Awesome recipe! Grapes are one of those things that I always have in the refrigerator, because they are such a great snack! Needless to say, this salad is calling my name! I’m loving the combination of textures and flavors, Geraldine! Filling, yet light and all around scrumptious! Cheers! This is my kind of fall salad Geraldine! I always lean more toward wild rice during the fall. My mom would love this one too because she loves her grapes! Can’t wait to give it a go! Thanks, Mary Ann. I loved this one – hope you and your mom enjoy it! 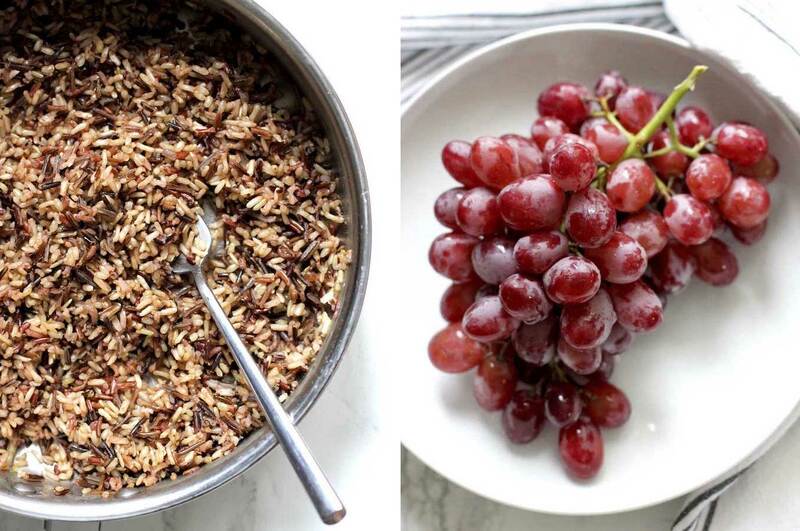 This is my first time using a wild rice blend, Traci – and it was so good! Definitely a great alternative to my usual quinoa – will be making more wild rice salads in the future! Made this salad today, as we are in the middle of a heat burst in the North East. Cooling, sweet, light and really delicious. Loved it. Thanks, Mom! Love that you made the recipe right away! There isn’t an ingredient in here that I don’t love! The nuttiness of the rice, sweetness of grapes, briny-ness of the feta, freshness of the herbs….OH MY! I could eat this all the time! Plus, it’s gorgeous! Thank you for sharing! Pinned! I agree, Annie – this one was a winner. Thanks for the pin!